I wish I could say that each day as I open the Word of God that I long for information, wisdom, or knowledge. Some days though, I just do it by rote. I read the daily read Bible and barely pay attention as I figure out my day ahead. Don’t get me wrong; I want to know more about God, I want to know how to deal with life’s daily issues that arise and I long for peace in this world of trouble we live in. Seriously I would love to be the perfect Christian Woman who always has the answers for every need but I know that if I can’t find the answer I can always ask God to show them to me. Often though, I find myself on a side path making my read time smaller and life’s troubles bigger. When times like this happen I like to go on a retreat, or take a step away from the normal routine. During these times you may see me sitting and reading from time to time, or staring off into space thinking on a portion that stood out to me in my daily reading. It helps when I remember what God has done in the past to help me through a rough spot or a dry spell of study, or if I share a Bible verse with someone. It also helps me to share a story like when I tell you I trusted God and my son who was beyond blue at birth who is now a sophomore at Grand Canyon University as an Honor Student. I found the answers in the Word and a worship song that told me to have faith in God, to trust Him and keep my mind on Him. I found that God will walk with us through fires, through storms and bring us safely to the place He needs us to be in to speak to someone else. 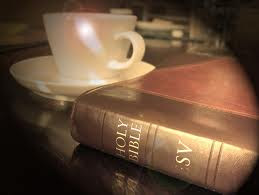 He will provide for us, feed us both physically and spiritually when we dig in to the nourishment in His Word today… so I will ask you what I ask myself when I get into a rut of reading and need a new reading plan; “what’s in His Word for you today? “ This is what I found today! There is Hope for tomorrow, for peace and for joy in the Word…justification, forgiveness, grace, and faith. We can find love, true love because God is love , its in the Word! Jesus tells us that He has given us peace, and hope that He will return some day for us. Because of this we can rejoice! God’s Word, our Bible, can tell us of things we did not realize about the attributes of God, and His love. (1 Corinthians 12, 1 Corinthians 13) He can teach us of His ways and show us how to walk in His path when we feel blinded by the burdens in our daily lives. All we need to do is open up the Word and ask Him to give us eyes to see and ears to here what His Spirit is telling us today. When I get too busy for God, His Word gets further away from my mind. When this happens and things don’t go how I want I get cranky, like the candy bar commercial I ‘go all diva’ on my family. When I am in the Bible daily, and worshiping the Lord through out my day with my daily living; I find it easier to hurdle over the problems that arise and to do it peacefully even if I hurdle over and find there is a pile of mud on the other side to land in. You know you here of the peace that passes understanding, and joy unspeakable? They really happen when you keep your mind on Him and your eyes in His Word. If you take on the challenge to at least read a Proverb or a Psalm day for one month and think on that scripture through out your day you will find things work together much better for you. If you take the time to pray before and often after the read you will find it makes a lot more sense to you as to how to apply it to your life. If you still don’t get it, ask a friend! Comment on my blog, call me, or email me I will be happy to join you and glean from His Words! I don’t always know the answers but its fun to figure it out together! When you put the right ‘food’ in the right stuff will come out. 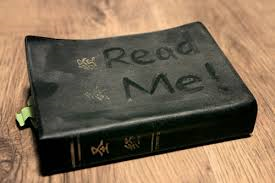 When we read the Word, even just by rote something is going to sink in; I do not recommend going on a Bible fast! Read to be fed, not just to read and you will see the fruit of your labor today. Dear Heavenly Father; fill us with the goodness of your Word today, bless our going in and going out and let Your Word be our words. In Jesus name, amen.